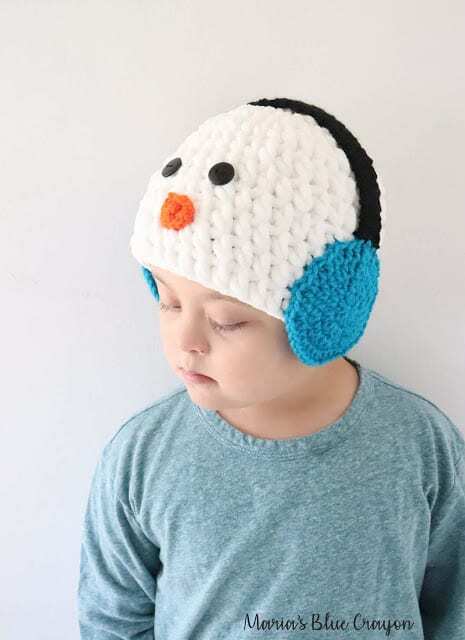 Scroll down for the free snowman hat pattern in sizes newborn, 3-6 months, 12-18 months, toddler, child, and adult! I’ve had this crochet snowman hat in my mind since last winter! With so many ideas in my head, I just couldn’t get this crochet snowman hat out on in time last year. 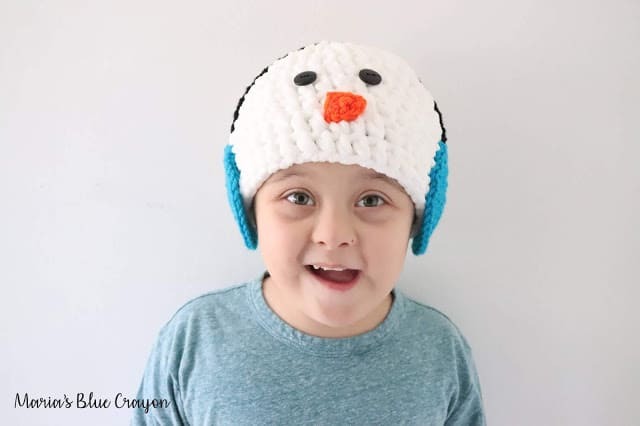 I’m so glad I waited to make this hat because last year, I didn’t have the idea to use Bernat blanket yarn for the main portion of the snowman hat. I love how squishy, plush and soft it is! 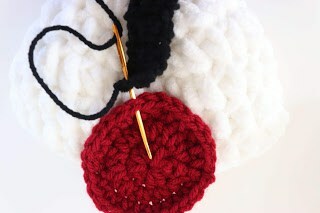 Another plus for using the Bernat blanket yarn is that this crochet snowman hat works up rather quickly! The yarn is very bulky so very few rows are needed for these hats as well. 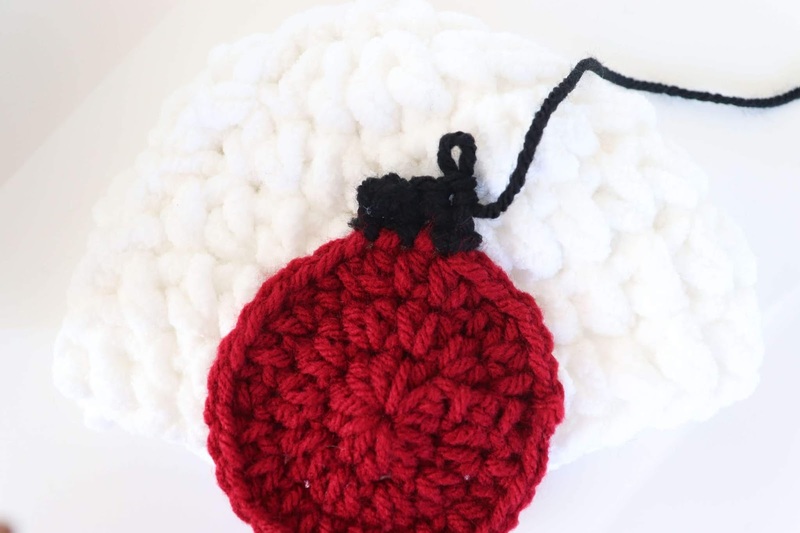 I had to rework this crochet snowman hat a few times for a few reasons. At first, I made the hat one row shorter than usual so I could use the earmuffs portion as the earflaps. It was a really good idea, but the hat just wasn’t long enough to cover the back of my son’s neck. 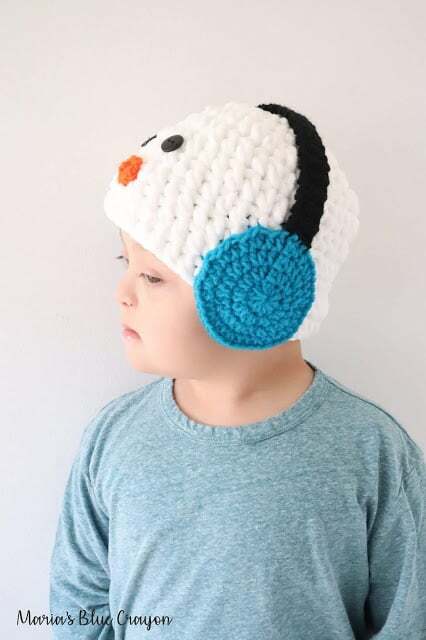 I wanted this to be very warm so I pitched the idea of using the snowman’s earmuffs as earflaps, added another row for the hat, and just sewed the muffs on a bit higher so they wouldn’t hang down so low. The crochet earmuffs still act as earflaps but not as pronounced as I first had it! I could have kept them lower as ear flaps but it looked a bit funny once the face was on because it looked like the snowman had very low “ears”. The earmuffs I crocheted a few different ways, but settled for a 2D design as it was the easiest and looked the best! The face should have been easy, but I did switch around the placement several times as well as different sized buttons. It’s the little things that make it just right! So I hope you love this crochet snowman hat as much as I do to make a few for your loved ones! Purchase the ad-free PDF on Ravelry here. Sharing in any way really helps my blog keep going – thank you so much! 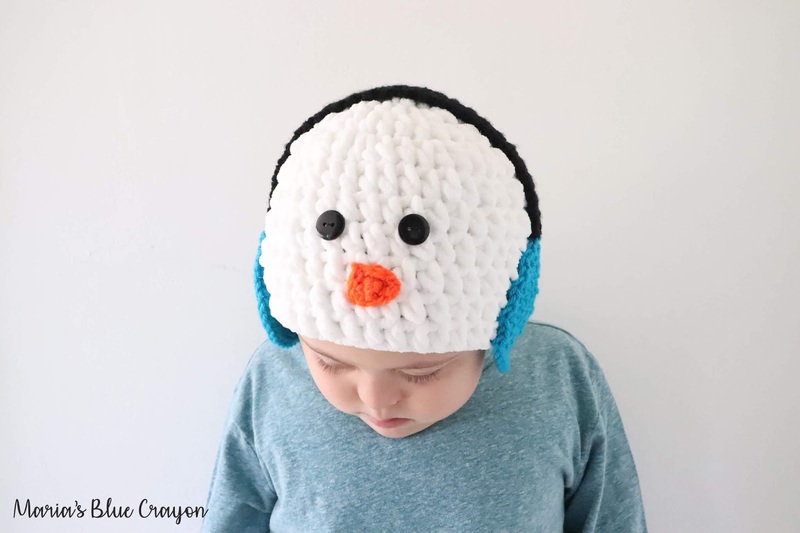 The hat will be made first, follow the instructions for the size you are making below then go onto the next section to make the ear muffs (there are different sizes for this as well). The ear muffs will be sewn on to the sides of the hat. The earmuff strap will then be crocheted on and the face embellished. Beginning chains of each round/row does not count as a stitch. Fasten off and leave tail end for sewing. Make 2. With tapestry needle, sew the ear muffs onto each side of the hat around 3-4 rows up from the bottom. Using black yarn and 5.00mm hook, attach yarn onto the top of one ear muff and follow the directions below for the size you are making. Repeat until the strap is long enough to go over the hat and reach the top of the other earmuff. Sew onto second earmuff. Attach black yarn to top of ear muff and make the amount of single crochets needed depending on size, making sure it is relatively centered. Continue to crochet the strap. Once the strap is long enough to reach the top of the second ear muff on the other side, sew on with tapestry needle. Reinforcing the strap by sewing it onto hat can be done as well but not necessary.